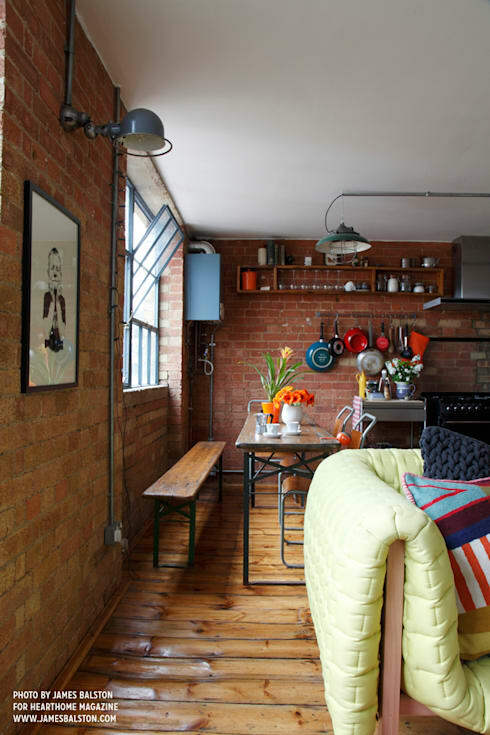 Warehouse conversions are a very dominant feature of the specific housing makeup of London, and in particular East London. For many younger people, especially those who are still at the stage of living with flatmates, living in a warehouse is almost a rite of passage. But that is not to say that every warehouse conversion is well executed, or even really liveable; warehouses come with a host of potential problems related to their origins, and can often be more trouble than they’re really worth. Poor insulation, lack of central heating, insufficient private spaces and rooms divided up in a counter-intuitive way are just some of the issues the warehouse-dweller may be unlucky enough to come up against. For some people, this is all part of the grit of the experience, and it’s an experience they consider worth the hassle. But those who don’t share that sentiment, there are fortunately many warehouses out there that have been so skilfully converted that they feel like true homes, but have retained many of their most appealing original features, such as enormous windows and generous interior spaces. This warehouse in Whitechapel, East London (expertly converted by Cassidy Hughes Interior Design & Styling), is a simply brilliant illustration of how a shell of a building can be turned into something really special. All it takes is a bit of investment and a very good eye. The raw, slightly grimy associations that may conventionally accompany warehouses as living spaces are tempered here by pretty little touches that take the edge off things. 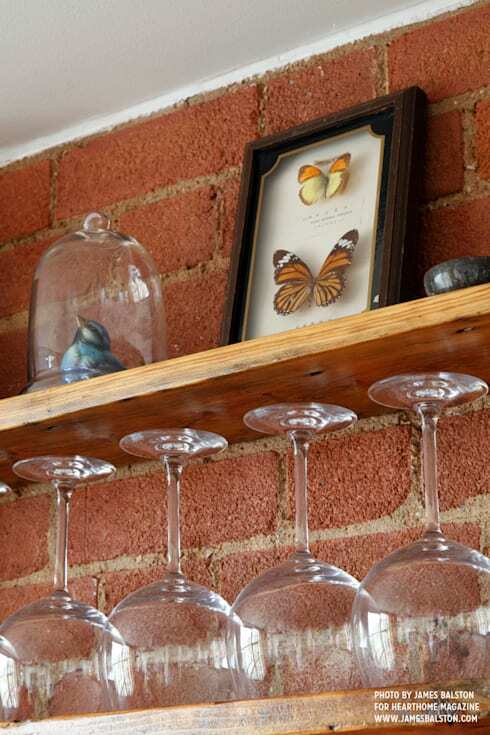 These vintage taxidermy butterflies and the bird next to them are good examples of how something a little more natural has been allowed to bring its influence to what ought to be a fairly industrial setting. The warm tone of the floorboards and the multicoloured accessories out on display counteract any potential coldness that could otherwise emanate from the exposed brickwork of the walls. Brickwork of this type can, if not properly accompanied by other design features that emphasise the homeliness of a particular space, occasionally come across as a little utilitarian; biut fortunately that is far from the case here. Again, detail is all-important. 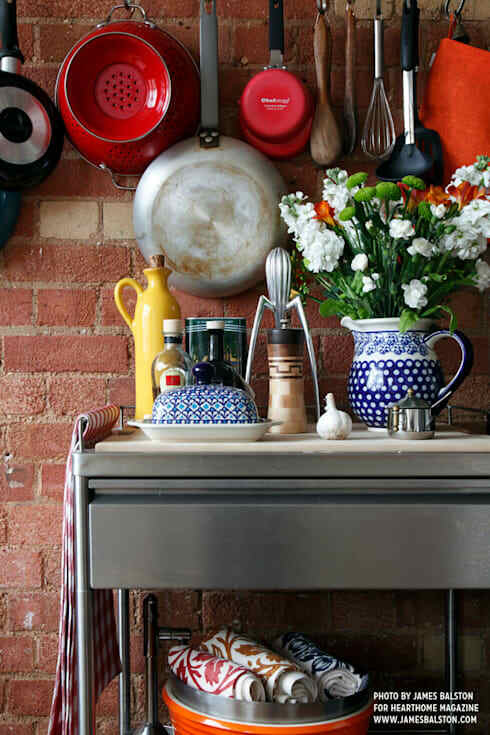 This kitchen trolley is loaded with cute, friendly pieces, while the cooking implements hanging in the background drive home that this space is truly lived in. 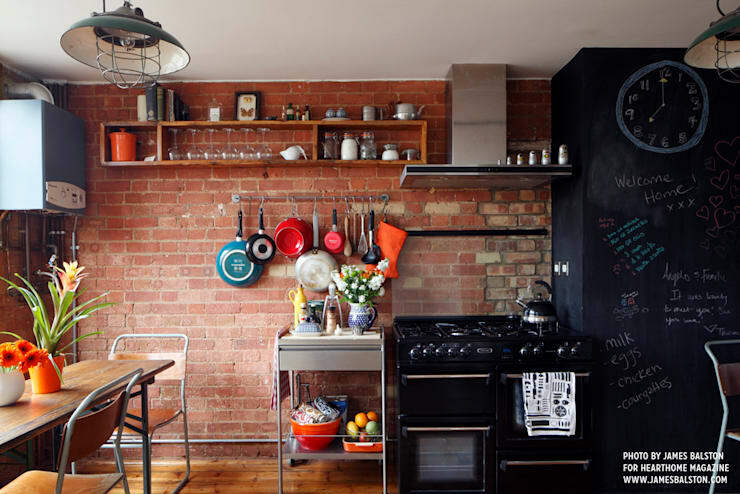 This image shows how well all the different elements of the kitchen space work together, as well as revealing some that we haven’t seen clearly yet – most interestingly the blackboard covering over a large section of wall. 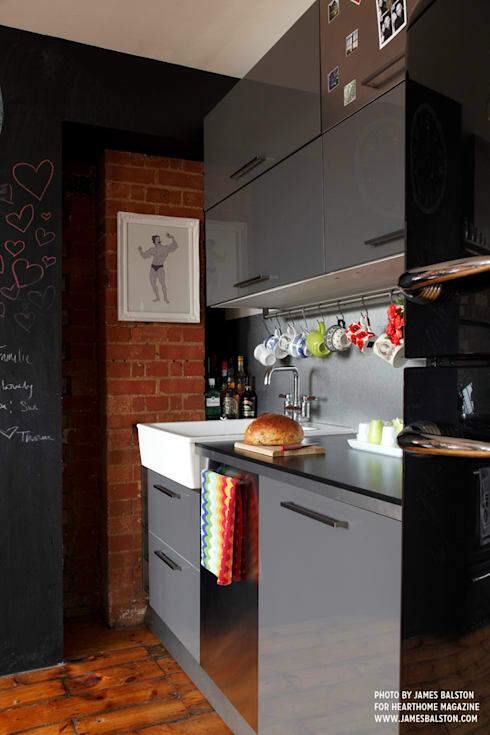 This helps the kitchen seem youthful and playful (regardless of the actual ages of the warehouse’s occupants). Here we can also see those fabulous ceiling lamps, a nod to the industrial origins of this apartment. This open-plan space is a continuation of the kitchen, and retains the same welcoming style with bright pops of colour that liven things up. This photo also offers the first glimpse of the warehouse windows that help make this apartment so special. A close-up shows off the industrial-style elements of the windows. 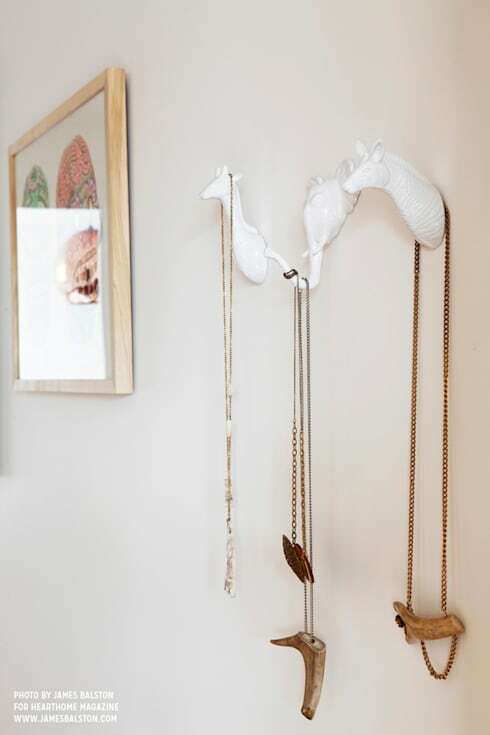 These adorable animal heads offer an unconventional jewellery storage solution. 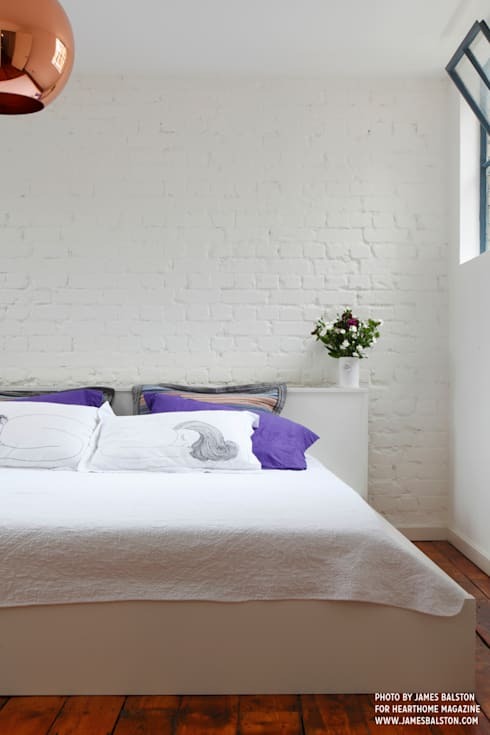 Painting the bricks in the bedroom makes the space feel a little cosier, a little more “finished”. Notice the gorgeous copper-coloured lampshade just visible at the edge of the image – surely the focal point of the whole room. What are your favourite features of this home? Tell us here!